Distributivism, also known as Distributism, is an economic theory formulated by Hilaire Belloc and G. K. Chesterton largely in response to the principles of Social Justice laid down by Leo XIII in his encyclical Rerum Novarum. Its key tenet is that ownership of the means of production should be as widespread as possible rather than being concentrated in the hands of a few owners (Capitalism) or in the hands of state bureaucrats (Socialism). Belloc did not believe that he was developing a new economic theory, but rather expounding an old and widespread one against the novelties of both Capitalism and Socialism. Belloc believed that Capitalism could never achieve economic equilibrium on its own. It is an unstable system for two reasons: divergence from its own moral theory and from insecurity of two kinds. The moral theory of Capitalism is based on freedom, but it tends to accumulate property in the hands of a few owners; as ownership becomes more and more limited, more and more power passes to a small capitalist class. The state increasingly becomes a tool to protect “wage contracts” which are increasingly leonine, that is, based on inequality. One side may refuse the contract (the employer), but the other side, the worker, generally has no choice but to accept it because the alternative is starvation. The state can no longer be a neutral arbiter between classes but becomes a defender of one class upon whom jobs and growth are increasingly dependent. In addition to this moral problem,Capitalism also has two kinds of insecurity: insecurity for the workers and even insecurity for the capitalists. There is insecurity for the workers because the wage fetches less in old age, nothing in sickness, and jobs themselves are at the discretion of capitalists3 (e.g., “outsourcing”). But Capitalism also produces insecurity for the capitalist. Competitive anarchy makes the system as unstable to owners as it is to workers and results in gluts and underselling. Capitalism responds by becoming less capitalistic; it uses the law to raise barriers to competition and to limit liability; the corporation itself is an adjustment to the inherent instability of Capitalism that allows investors to limit liability. The ardent socialist does not fear a pure Capitalism nearly as much as does the ardent capitalist. Given its instabilities, Capitalism must, perforce, find some way of stabilizing itself. Belloc argues that there are only three stable solutions: slavery, socialism, or wide-spread ownership of property, (or some mixture of the three.) “To solve Capitalism you must either get rid of restricted ownership, or of freedom, or of both.” Of the three solutions, slave societies have shown themselves to be highly stable over long periods of time, but this solution is precluded by our Christian heritage. But the third solution, what Belloc calls the “proprietary state,” is regarded as untenable by the intellectual and political elites, which leaves only the second solution, some sort of socialism. Thus in practice Capitalism breeds a collectivist theory which leads to a servile state. The transition to socialism follows the line of least resistance because nothing really changes when the state buys up the waterworks or the rail lines. But socialist practice does not really mean socialism. In practice, socialism merely means increased regulation, a solution that appeals to both corporate interests and socialist “reformers.” Although the rhetoric is different, the results are the same. The “socialist” reformer continues to pile regulations on top of big business, a situation big business is more than content to see, because in return these regulations serve as entry barriers to potential competitors and thereby guarantee greater security from competition and hence greater security of profits. In turn, the capitalist becomes increasingly responsible for the welfare of the workers in return for a greater security of property and profits. In the end, you have neither socialism nor Capitalism, but servility, the servile state. The practical result of all of this is an increasing dependence of workers on the government and corporatist solutions. Health care, unemployment insurance, and retirement benefits pass from control by the individual to control by the corporation or the state. The servile system has already begun. Indeed, it is already here. The differences between a “socialist” Europe and a “capitalist” America are merely differences of degree rather than of kind. Both depend on the same bureaucratic organization and social welfare systems. This state of affairs did not come about by way of conspiracy but by way of necessity; Belloc seems to have been absolutely correct in his predictions. Until the 1940’s, Capitalism was a highly unstable system suffering ever increasing cycles of economic euphoria and depression, culminating in the Great Depression of the 1930’s. The system needed help to stabilize itself exactly as Belloc said it would. The real change came with the introduction of Keynesian economics, which made the government responsible not just for this or that social welfare program, but for making up shortages in aggregate demand by redistributive taxes. In other words, Keynesianism is itself “distributist,” or rather “re-distributist”; but it redistributes income rather than property. Therefore the debate, in practical terms, is not between Distributivism and its opposite, but between kinds of Distributivism, between redistribution of income and distribution of property. But one way or another, economic liberalism cannot provide stability on its own; it needs the help of distributists of one sort or another. Income redistribution, being a constant and ongoing process, will always require a vast state apparatus to assess the funds on the one hand and determine eligibility on the other. Keynesianism has been adopted by nearly every modern regime, whether of the right or left, because it seemed to work. As a result, the inherent instabilities of Capitalism have been rendered less extreme, with depressions rendered much milder than the convulsion which shook this country and Europe at the end of the 1920’s. But Keynesianism enlarged state power, taxes, and the size of government to previously unimagined levels. We have become accustomed to having the government solve all problems and do so at the highest possible level. Even right wing administrations have dropped all pretense of “federalism” and seek to intrude more and more on daily life; the teacher in his classroom, the cop on the beat, the shopkeeper in her store become increasingly the objects of federal concern and less of local regulation. But today the future of the Keynesian arrangement seems in doubt. In both Europe and America, the costs of government seem ready to outstrip the ability of society to support them. Further, the willingness of corporate interests to continue the arrangement is ending; they have invested great sums and great energies in seeking an end to the system and their efforts are paying off. Corporations are seeking to externalize social costs that have theretofore been part of the wage system, such as medical insurance, pensions, and unemployment costs. However, it is doubtful that shifting these responsibilities can be accomplished without introducing the very insecurities that occasioned the arrangements in the first place. Thus the Keynesian system seems to be caught in a conundrum, the very conundrum pointed out by Belloc. It cannot continue its Keynesian bargain (and this is especially so in the face of global competition), and it cannot drop it without risking chaos. The economic theory of Distributivism is based on the distinction between distributive justice and corrective justice found in Aristotle. Distributive justice deals with how society distributes its “common goods.” Aristotle defines these as “things that fall to be divided among those who have a share in the constitution” (Nicomachean Ethics, 1130b, 31-33). This refers to the common goods of a state, a partnership, corporation, or some cooperative enterprise. For Aristotle, these things should be divided by “merit” based on contributions, but what constitutes this merit will be a matter that is determined culturally, “for democrats identify it with the status of freeman, supporters of oligarchy with wealth (or with noble birth), and supporters of aristocracy with excellence” (Ethics, 1131a, 25-29). Corrective justice, on the other hand, deals with “justice in exchange”; that is with transactions between individual men. In this case, justice consists in exchanging equal values, in “having an equal amount before and after the transaction" (Ethics, 1132b, 19-21). Corrective justice is properly the subject of economic science per se, while distributive justice is irreducibly cultural and involves decisions about what constitutes a just distribution. Modern economics tends to treat distributive justice in one of two ways. For the socialist or the Keynesian, it is primarily a political question and necessitates control of the economy by the state. For the orthodox neoclassical economist, distributive justice will be the unintentional result of the achievement of equilibrium under conditions of perfect competition (cf. John Bates Clark, The Distribution of Wealth); in other words, equity would be an automatic by-product of equilibrium. Hence distributive justice is swallowed up, as it were, by corrective justice and accomplished without anyone intending it, the very essence of the “invisible hand” theory. However, this has never happened and is never likely to happen. It is not only that the necessary conditions (e.g., “perfect” competition) can never be satisfied, nor even that justice, a virtue, cannot be divorced from human intentionality. Rather, the problem is with the very nature of corrective justice, which is “equality in exchange.” Thus corrective justice tends to perpetuate whatever division of property existed before the exchange; distributive equity cannot therefore result from exchanges (Cf. Pareto optimality). But for the Distributivist, distributive justice is prior to corrective justice (as it was for Aristotle and Aquinas), just as production is prior to exchange. Thus equity is prior to equilibrium, and equity will depend on the distribution of the means of production. Equity is not the by-product of equilibrium but its cause; indeed, equity and equilibrium are practically the same word and very nearly the same thing. Distributivism is often viewed as a romantic “back to the land” movement, or even a desire to return to the Middle Ages. But this criticism is unjustified. Indeed, well-divided property has both a long history and a current presence. Two examples should suffice: the “land to the tiller” programs of Korea and Taiwan, and the Mondragón Cooperative Corporation. In Korea and Taiwan after the Second World War, the estates were broken up and sold to the peasants at a rate well below market values. The resulting increase in purchasing power of the previously penniless peasants spurred the growth of business and industry and catapulted these nations from backward and oppressive societies to modern industrial states in only one generation. In the Mondragón Cooperative, 77,000 worker-owners do $16 Billion/year in sales making everything from muzzle loading hunting guns to modern built-to-order factories. They also operate an extensive network of social programs, schools, colleges, training institutes and research facilities. In addition, we can cite an impressive number of successful ESOP’s and other employee owned businesses. Thus Distributivism would seem to be perfectly adaptable to the modern world and even confers competitive advantages. Leo XIII in Rerum Novarum viewed the just wage as the means of spreading ownership; Belloc reversed that by finding that wider ownership was the means of achieving the just wage. In this, Belloc appears to be correct, as John Paul II acknowledged when he called for associating the worker with the ownership of the workbench at which he labored. It should be clear that the only way to reduce the size of government and increase the range of freedom and justice is to eliminate the need for big government. 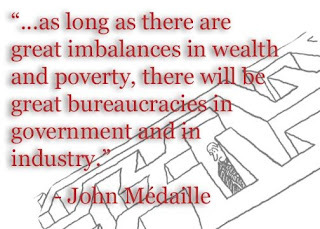 But as long as there are great imbalances in wealth and poverty, there will be great bureaucracies in government and industry.